Fiber benefits the digestive system and helps to increase the feeling of fullness between meals. A diet rich in fiber is helpful in relieving constipation and helps to prevent breast and colon cancer, diabetes and obesity. (1.9 g). By eating the skin also, the dietary fibre increases to 2.5 g.
This water-soluble vitamin helps our bodies form red blood cells and aids in the formation of genetic material within every body cell. 5% Daily Value. If eaten with the skin, folic acid content increases to 7% of Daily Value. An integral part of many proteins and enzymes that support good health, iron pays a vital role in transporting oxygen and in regulating cell growth and differentiation. 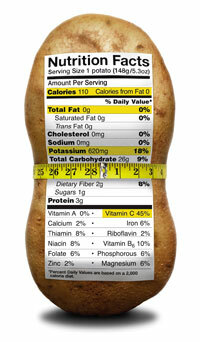 When eaten with the skin, a potato contributes 9% of Daily Value and is considered a source of iron. Niacin aids the functioning of the digestive system, the nerves and the skin and plays a key role in converting food to energy. 10% of Daily Value. Eaten with the skin, niacin increases to 12% of Daily Value. Assists in muscle contraction and maintaining fluid and electrolyte balance in our body cells. Potassium is also important in sending nerve impulses as well as releasing energy from protein, fat and carbohydrates. Excellent source of potassium (446 mg). When eaten with the skin, potassium content increases to 572 mg. Helps our body cells convert carbohydrates into energy. It also plays an essential role in the functioning of the heart, nervous system and muscles. 10% of Daily Value. When eaten with the skin, thiamine increases to 12% of Daily Value. Helps synthesize antibodies in our immune system. We need antibodies to fight many diseases. Vitamin B6 helps maintain normal nerve function, the formation of red blood cells and aids the digestion of proteins. High in Vitamin B6 (20% of Daily Value). Eaten with the skin, Vitamin B6 increases to 24-25% of Daily Value. Vital to the production of collagen, which is the most abundant of the fibres contained in our connective tissue. Connective tissue gives the body form and supports our organs. Skin, bone, teeth, tendons, ligaments, fascia and organ capsules. Organs (e.g., liver, spleen, kidneys). Cartilage. The separating layer between skeletal and nervous system cells. Vitamin C also helps protect fat-soluble vitamins A and E and fatty acids against oxidation. 16 % of Daily Value. If eaten with the skin, the Vitamin C increases to 30% of Daily Value.